The Altar Guild is a group of women and men who prepare and tend our worship spaces. These faithful people work with the clergy to care for all the liturgical items needed to worship in church. It is a ministry of love undertaken in the name of Christ. From the beautiful altar hangings, to fair linen, to Eucharistic vessels, to the books of our worship, and the candles, the flowers, the bread and the wine, the Altar Guild personally makes sure all is in order for our praise and thanksgiving to God for all life's blessings. Altar Guild members also make sure that our worship space is kept clean and tidy. Members share all duties equally on a rotating basis. We prepare the chapel and sanctuary on Saturday mornings, and finalize details prior to both services on Sunday mornings. The Guild also maintains the inventory of worship items and orders all needed supplies. 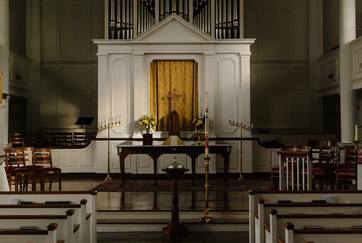 At least one member, and sometimes more, is asked to be present at each worship service and special services (i.e. weddings, funerals and Christian holidays). ​Ministry on the Guild opens a person’s eyes to how each item in our worship has significant meaning in our Christian faith and enhances individual worship and experience of God.